The following story by Robert Crowl (Briamar Press) is written from the heart. It is confronting, but we chose not to edit it, as it reflects the feelings of this family. The treatment of cancer has moved forward greatly since this period and in reading this article it only reinforces the need for research. It must also be noted that none of the treatment carried out was at the Royal Children’s Hospital. Hello, My name is Robert Crowl. My family and I are very happy to help CIKA by providing this outstanding group of people with their print requirements through our printing company. Cancer is an insidious disease that has touched most people in various degrees. For some it may be the loss of a person they have had some small association with. For others the discovery that a person that is the very epicenter of your lives has cancer. Lives are changed forever, both the one diagnosed and those traveling with this much loved person on the toughest and most emotional journey they will ever have to make. I wish to share with you some moments from the journey taken twice by my family with the loss of two daughters, our sisters, Christine and Helen. This story has two perspectives. One experienced as a child with the loss of my elder sister Christine, the other as a man with the loss of Helen, my younger sister. However for my parents, the loss of two children to cancer is unimaginable. Christine was a girl with a great personality, a very caring nature and very smart. She used to talk about one day becoming a teacher. Chris liked to help Mum cook and loved crafts. We were a pretty normal happy Aussie family. Dad had a small print shop in Bulleen and Mum was a nurse. Together they were raising five active and somewhat noisy kids. However one day when Christine was in year 8 the world changed for Mum and Dad. After been hit by a chair in class Chris’s leg became swollen. The swelling was very painful and would not subside. The doctor ran tests and Chris was diagnosed with Acute Myeloid Leukemia and hospitalized. That night we could hear Mum and Dad crying in the kitchen with my Grandparents. They decided not to tell the four of us kids at that time, knowing that Chris would have hated been treated special by us. Many of you reading this would know, how life changes. The family routine had to revolve around hospital visits, this was especially hard for M&D who had to keep working and running the business. Eventually, Christine went into remission and we were all so grateful, Life went on for us three boys and our younger sister. For the parents of a sick child however, life cannot be the same. They were haunted by the fear that this incurable cancer might return. Unbeknown to us, Christine was on so many tablets that her body development was stunted. I cannot imagine the emotional toll this would have had on a young girl, particularly at high school. Christine was blessed with wonderful friends. Two and a half years after the diagnoses, Chris and I went off to the movies in the city, she was 14, I was 12. As we went to board a tram I had to help her up the steps, her leg was suddenly hurting a lot. When we got home and mentioned this, the folks thought the worst, the cancer had returned. Over the following ten weeks Christine had a very awful time, including a Spleen Ectopy. This was when M&D told us what was wrong with Chris as were older now. Steven as the eldest had known for a while. We were devastated. During the last ten weeks of Christine’s life, there were some terribly tough times. As a family we all pulled together and along the way we were witness to the creation of special memories. Some heartfelt brave and beautiful words were spoken and I realised Christine knew her dire situation when I asked if she still wanted to be a teacher, she didn’t answer me, just cried. Christine lost her battle on July 14th 1975. Chris was 15yrs and 1 month. The recovery for a family loosing such a vital and important person takes its toll on everyone. I remember the neighbors all coming in, the shop owners hugging me in the street, all the kids at school staring at me. I remember how we all missed Christine so very much. The family dynamics had changed forever. In 1991 my younger sister Helen began having dizzy spells. Helen was 25 years old, married with two children, Cameron 4 and Mathew 18 months. During a check up the doctor said something was wrong. 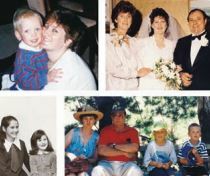 We were shaken to the core when Helen was diagnosed with a Malignant Brain Tumour on Valentines Day 1992. When her husband came home with flowers that evening Helen broke the news to him. Later that night the family rallied together. Helen was calm and collected, I suspect to ease the worry she could see so evident on the faces of the family she loved so much. She had brain surgery, a very dangerous procedure as the tumour was located in the speech and memory part of the brain. The bulk of the tumour was removed but some of the tentacles of the tumour were inoperable and were attacked with radio therapy and chemo therapy. Nine months later Helen was given the all clear. However, we were told the tumour might return and if so, radio therapy will no longer be an option as the maximum dosage of radio therapy had been reached. Life continued happily for the following 4 1/2 years then Helens writing style started to change slightly and by the end of that year Helen started getting regular headaches. We were concerned. A visit to Helen’s neurologist gave us tremendous relief when he told Helen it was nothing more than sinus. We felt elated and relieved. Helen and her husband were in the process of building six new townhouses and had so much in front of them. On 16th January 1996, Helen went in for the sinus operation. There were complications with the surgery and it was discovered that Helen’s tumour had come back with aggression; the tumour hemorrhaged causing bleeding on the brain causing a massive stroke. She was rushed by ambulance to another hospital. We were told she might not survive. The shock made us all sick. The family gathered waiting by the phone. Helen survived the operation but with irreparable brain damage and was in a coma for two weeks on life support. On the 2nd Sunday morning I walked into the I.C.U and saw Helen open her big blue eyes. We did not know if we would see them again. The joy was over whelming. However, she could not remember us, talk, walk, or feed herself. We were told that due to the severity of the stroke that they would not treat the cancer. Over the following 5 months a family member was with Helen as much as possible. The doctors could not believe the vast improvement in Helen, she was now walking, was bright and having good conversation and a joke. Her eye sight was permanently damaged but new glasses helped enormously. The doctors started treatment using new drugs. Over the next three and a half years Helen was presented with many challenges including several high risk brain surgeries. Helen’s body made some dramatic and unfortunate changes due to the treatments but this woman’s fantastic personality remained unchanged. Each time someone close to her looked worried about a situation confronting her, she would put everyone at ease; her strength and attitude were remarkable and to this day I remain in awe of her. Her final days were very difficult, under going constant treatment along with the physical disabilities due to the stroke made life hard. It always amazed me though how Helen coped and kept her humour and zest for life and even how she kept her house so clean with two young boys. I was having dinner with Helen whilst her husband and boys were away. She was not well and for the first time actually said she needed to visit the hospital. I knew then that something was wrong. I phoned Mum and Dad to meet us there. When Mum saw Helen I think she knew. There was the saddest look on Mum’s face. Helen was admitted and all the family gathered the following morning. We were told that Helen had developed Leukemia due to the chemo and that she would die. Ironically the same disease that stole her elder sister’s life. It was difficult to accept that it was the treatment that was to take Helen’s life, not the cancer. When we told Helen she said, “No! I can’t go. I have two beautiful boys to raise. I am not going anywhere!” The strength Helen showed that night was truly unbelievable. Even Mum, who had been nursing for 40 years, said she had never seen such bravery or composure. Helen cuddled her boys and said to them the most wonderful words and took us each by the hand for our own special words, then looked at us all and told us how lucky she is to have us as her family and then said, “I’m so sorry to have put you all through this”. A bit later she said, stop looking so sad, go home and get some sleep. I will see you in the morning. Helen died that night. We could not believe she had left us so suddenly. One week earlier she was fine. It was an awful shock. As we left the hospital, walking together with her children the rain fell heavily on us. It was a poignant moment, etched forever in my mind. Helen’s funeral filled the church to overflowing with the people that loved her. She had touched so many lives, had fought a brave battle and made us so proud of her. The aftermath of cancer is hard. Everyone’s life is altered forever. It’s especially tragic when children are left without a mother. But I believe if you look hard enough there can be positives. When people you love become so ill, you do say and you do things for them that you otherwise may not have. You tell them “I love you”. You see so much good in that person; their strength; their dignity; their love for you. They become your hero. I try not to let smaller irritations bother me. I feel that through my experiences with cancer I appreciate life so much more and those people that are in it with me. Thankfully we have people like the C.I.K.A group making a difference. Let’s hope one day the word cancer will not fill us with such fear. Thank you for allowing me to share some of the story of my two beautiful sisters Helen and Christine.